Does anyone have any data or info on reloading the Hornady SST for shotgun hunters?? Would appreciate any adivse available!!! Vint: You have confused me. Far as I know, Hornady SST stands for Super Shock Tip, and they are all centerfire rifle bullets...identified by a bright red polycarbonate tip, a'la Nosler Ballistic Tips. Not a shotgun thingie in the lot, again afaik. Yupper, Morax, that is the one!!! It is the best I have found in shotgun ammo for deer!!!! I shoot the 300gr sst in my H@R Ultra Slug Gun. 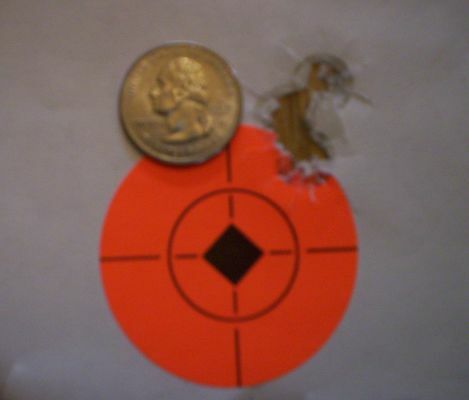 their's a pic in my photo album a 3 shot group @ 75yards ya can cover it with a quarter .It is a outstanding slug (imo). i can imagine, out of a good slug gun this thing would be ignorant!! i love the balistic tipped ANYTHING cause of what it does.. the old joke I hit you, you hit the ground comes into play with this round.. i will check around but i would say hornady would be yer best bet for reloading data for it.. I put one in the boiler factory of a good 9 point last fall and he did not go over 12 feet with the slug completely through him. Shrpshtrjoe, that group sounds like my Ithica Deerslayer!! Vint2, I have taken a few deer with a Ithica deerslayer nice shot gun. I use to live in south eastern pa ( slug only ) and have used various slugs and have to say the hornady sst's are the most accurate I have ever shot. There rather pricy, I think the last one's I bought were $11.00 for a box of five so reloading them would be the way to go, I have not seen any data on them yet . Sounds like the prtices I have been paying and since I reload for my rifle I figure it is a great way to save a dime or two!!! I have not been able to find data and welcome infor from anyone who can help.So far Hornady has not been of help. Ohio is one of them damn shoulder-bustin' shotgun only states too. I've been slingin Winchester Supreme Partition Golds through my Mossberg 500 and have been very happy with everything but the price. Performance is great (Winchester claims 1900 fps with 2 3/4" and 2000 fps with the 3" shells), but at $16.99 a box(last year's price for the "little" ones), I'm lookin' for something else for the upcoming season. I haven't priced anything out yet this year, but I don't think that $20 bucks a box is too far off. MSRP @ winchester.com is $25.11 for the 2 3/4", $27.82 for the 3" and $26.35 for their new 2 3/4" XP3 load. I never thought I would say it, but it's now cheaper to fire my muzzloloader ($2.20) than it is to fire my shotgun ($5.00 projected)! I think you're on the right track, reloading shotgun slugs may be the answer to my problems too. Have you had any success locating the components? I think the SST slug is the same sold for muzzleloaders, but what about the sabots? Durn, they musta snuck that one in when I wasn't looking! I learn something new every day. Shows my ignorance of all things shotgun. That looks like it is some serious kind of hunting round, but how is the recoil? I shot a buddy's Mossberg Tactical shotgun with a one ounce slug...once. Never again! Hoo Boy! It's only natural that the proven performance of Hornady's SST bullet enter the world of shotgun hunting. This slug allows you to bring unheard of accuracy and terminal performance to slug-only areas. The super-accurate SST bullet delivers sub-2" groups at 100 yards; and the flattest trajectory on the market. Designed for use in fully rifled barrels only. I reload the LEE 1oz Key Slug and although I have never actually fired them on a target, they go where I aim them. I'm loading them using a Spanish powder, 25 grains of PSB 1, and a 28 gram wad with the petals shortened to about 25% long in 12 Gauge 2Â¾" (70mm) Plastic Reiffenhaauser style cases (Fiocchi Cheddite) , and find that its not a bad load at all. It doesn't kick like a mule....just a small pony....and isn't at all unpleasant to shoot. Love to try these SST's but unfortunately my shottie is a smoothbore. I have the new Hornady manual but it is only for metallic cartridges. Give Hornady's tech people a call, I bet they can email you something. The round is manageable, but it does have a little recoil. It is not for soft shoulders or weak hands, but it's advantages far out weigh the negs!!!!!! Muzzle stats are 2000fps/2664ft/lb for a 300 grain bullet. It is accurate, awesome, and the best I have found.